Colour Patches were the unique identifiers of the units of the First AIF. The shape and colour combinations of the patches correlated with the structure of the AIF. The rectangle shape indicates that it is a unit of the First Division. The light blue bar on the bottom signifies the third brigade of the Division. The purple upper bar indicates it is the second battalion of that Brigade. An 'A' was added to signify service at ANZAC. "Pro Patria" by Steve Larkins, Bob Kearney and the 10th Battalion AIF Association. The 10th Battalion owes its origins to militia companies established in the Colony of South Australia as far back as 1860, whence the name "Adelaide Rifles" originated. The 10th Battalion AIF was among the first raised after the declaration of War on the 6th August 1914. It was formed in Adelaide as the first of several battalions raised in South Australia. It was allocated to the 3rd Brigade in the First Division together with the 9th (Queensland), 11th (Western Australia) and 12th (Tasmania) Battalions respectively. On 12 August 1914, Colonel Ewen George Sinclair-Maclagan, the newly appointed commander of the 3rd Brigade, cabled Colonel Stanley Price-Weir, (a distinguished officer in the South Australian militia) asking him to consider becoming the first commanding officer of the 10th Infantry Battalion, soon to be raised. Price-Weir accepted the brigade commander’s offer on 16 August, and the following day was appointed the first commanding officer of the 10th Battalion AIF. As commanding officer, one of Price-Weir’s first tasks was to forward recommendations to military headquarters for key staff to fill the appointments in the battalion, that would assist him in raising its full strength of 31 officers and 974 other ranks as quickly as possible. He required, at the very least, a second in command, an adjutant, a quartermaster, eight company commanders and sixteen subalterns to command the platoons. The Battalion formed and was steadily built up in strength during August and September 1914 while encamped at Morphettville Racecourse. It was to comprise 1,005 men organised in seven companies with two large platoons within each company. 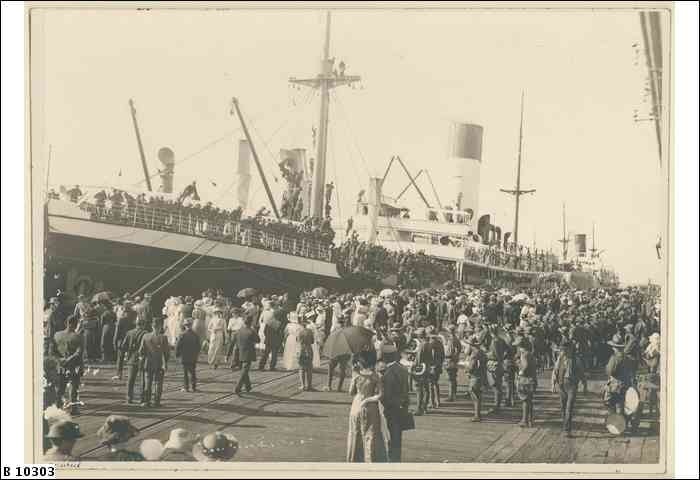 The Battalion embarked on the HMAT 'Ascanius' on the 20th October 1914 and sailed with the ANZAC convoy for the Middle East. The soldiers recorded the excitement of the duel between HMAS Sydney and the German raider Emden, which could so easily have wrought havoc among the troopships. After a stopover in Colombo, the convoy disembarked in Port Said on 1 December 1914. After several months training based at Mena Camp in the shadow of the Pyramids, the Battalion once again embarked, on the 12th of March. This time, they were on the steamship 'Ionian' for the island of Lemnos in the Aegean Sea. After consolidation at Lemnos, the force embarked - this time the 10th Battalion were boarded on the battleship HMS Prince of Wales. The 3rd Brigade was to be the covering force for the ANZAC landings (ie first ashore). The 10th Battalion had formed a Scout Company to lead the way and into this company went the ablest soldiers in the unit. 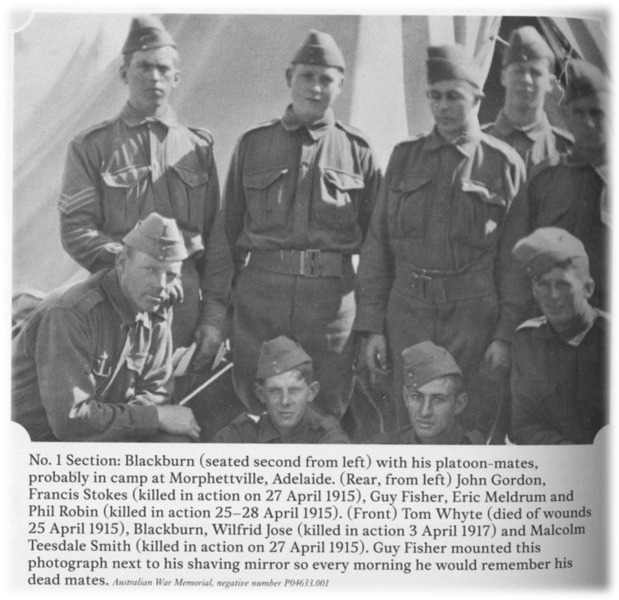 The battalion suffered nearly 50% casualties in the first few days immediately after the landing, many among the Scouts, among whose number were Phil Robin (a former Norwood footballer) and Arthur Blackburn. They are credited by C.E.W. Bean, the Official Historian, as having made it farthest inland of any Australian troops, to the 'Third Ridge'. 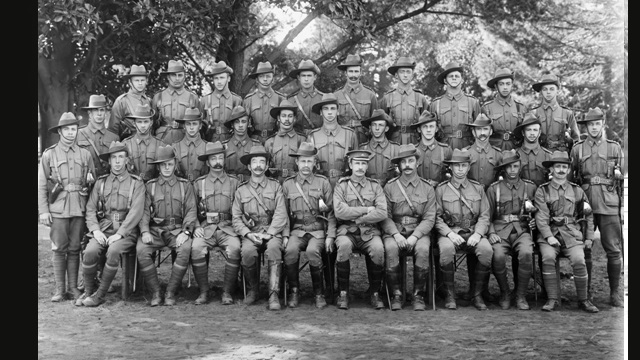 The 10th Battalion distinguished itself at the landing and throughout the remainder of the Gallipoli campaign. It played a key role in repelling a major Turkish counter attack on the 19th May. In August, the 3rd Brigade was the Division Reserve for the attack at Lone Pine mounted by the First Brigade. By this time disease was taking its toll mainly due to poor sanitation and deteriorating hygiene. Dysentery and enteric fever (typhoid) were rife. LtCol Price Weir was one of many evacuated ill in September. 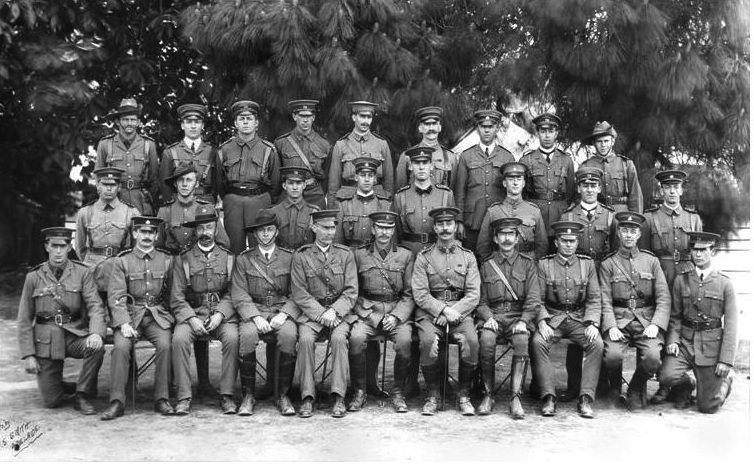 The Battalion evacuated Gallipoli on the 21st November, part of the draw down prior to the main evacuation which took place on 19 December 1915. It returned to Egypt where on 26th February the 10th Battalion and the other then sixteen Battalions of the 1st Division were split in two to seed the newly raised Fourth Division with combat experienced men. The 10th spawned the 50th Battalion, which came to be known as "The Barrier Battalion" with the original 10th Battalion Second in Command, LtCol Hurcombe its inaugural CO.
From Egypt the Australians embarked for Europe arriving in Marseilles on 16th April 1916. After an initial period in "The Nursery" sector in Flanders, the 10th Battalion went on to serve with distinction at Pozieres, where it was engaged in sustained and unrelenting combat between 22-25 July, at a cost of 350 casualties. For his actions on 23rd July, Lt Arthur Blackburn (the same man who distinguished himself at Gallipoli) was awarded the Victoria Cross. 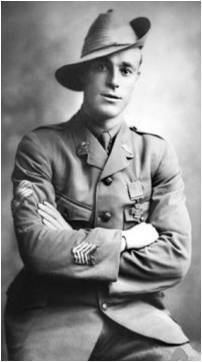 Blackburn would go on to become one of the most distinguished citizen soldiers Australia has produced, serving with distinction in two World Wars and in public life. Reinforced, the Battalion was back in action at Mouquet Farm between 19-23 August. After time in Belgium during the winter of 1916-17, one of the coldest on record, the 10th Battalion returned to the Somme in February where it was involved in action near Le Barque. Thereafter the Battalion's exploits were a catalogue of key battles. Bullecourt in May 1917, was followed by a period of rest and training. Then the 10th deployed in late September to take part in the great operations of what is now known as 'Third Ypres' in Belgium. Ypres, now known as Ieper, is a medieval walled city and was virtually levelled in the course of three months of fighting on a massive scale. There were a series of key battles that defined the Third Ypres campaign. 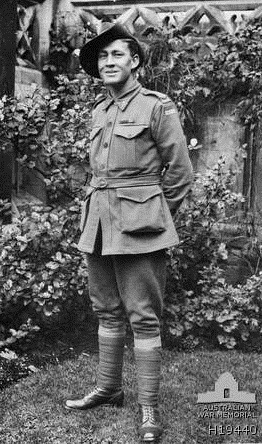 The first was the Battle of Menin Road on 20 September.1917 The Australians extended the front line to the fringes of Polygon Wood, where Private Roy Inwood was awarded the Battalion's second Victoria Cross for his action in taking out a German Machine Gun. His Victoria Cross is displayed in the Adelaide Town Hall, along with an original set of 10th Battalion Colours, the unit 'flags' that carry the units official "battle honours" emblazoned on them. The Battalion was in supports for the battle at Broodseinde Ridge on 4 October and was involved in handling the hundreds of prisoners that resulted, moving forward to relieve the 1st Brigade on the 5th October. On the 9th October, the Battalion suffered heavy losses when most of a large fighting patrol of 80 men in the vicinity of Celtic Wood, east of Broodseinde Ridge, became casualties. This action has attracted a degree of infamy as one of the enigmatic 'mysteries' of the Great War. It will be dealt with in a special section in this website, where 100 years of asserion and inuendo are dispelled thanks to superb research by VWM stalwart Bob Kearney in his book 'Raid on Celtic Wood' published in late 2017. In March - April 1918, the Germans launched a major offensive, called Operation Michael, using the recently returned Divisions released from the Russian front after the Bolshevik Revolution. Their aim was to reach the Channel Ports and capture the city of Amiens severing the link between Paris and the English Channel. The 10th Battalion was at this time deployed with the rest of the 3rd Brigade, near Hollebeke and then Meteren in Belgium, where it doggedly defended its allocated sector. In late May most of the Australian Divisions moved south to the Somme but the First Division remained in the Merris sector on the French / Belgian border, throughout June, engaged in sustained heavy fighting. On 28th June, Corporal Phil Davey won the Battalion's third Victoria Cross by destroying an enemy machine gun that had moments before inflicted casualties on a neighbouring Platoon. The Battalion took part in the eventual capture of the town of Merris in July and was then re-deployed to the Somme. On the 8th August the Battle of Amiens began (well east of the city) the great August offensive known as the "Hundred Days" during which the ANZAC Corps swept all before it, under the command of General Sir John Monash. The Battalion took part in the attacks on the Hindenburg Line in late September 1918. A number of German field artillery guns captured at this time are to this day displayed in a number of South Australian suburbs and towns including, Victor Harbour and Murray Bridge. It along with the rest of the AIF, was withdrawn from the line after the 5th October and were resting reinforcing and training when the Armistice was declared. When the dust had settled, on 11th November 1918, the Tenth Battalion had sustained 1,010 men killed in action comprising 61 officers and 949 Other Ranks. The men of the Tenth Battalion who survived the Great War, like their peers throughout Australia, came home to get on with the rest of their lives. Many didn't last long. The after effects of wounds, gassing, disease, injury and psychological scars all took their toll, often quite quickly. The men formed Associations out of which was spawned organisations like the RSL to look after their injured colleagues and Legacy to take care of the widows and families of the fallen. The Tenth Battalion AIF Association was central in enabling men to keep in touch with one another throughout the reminder of their lives. Unlike many others however, the Association persists to this day, its ranks renewed by members of the 2/10th Battalion from WW II, albeit now few in number, and from the 10th Battalion Royal South Australia Regiment and more recently the merged 10th/27th Battalion of the Army Reserve, many of whom have seen recent overseas service on Peacekeeping Operation in the Solomon Islands. They proudly perpetuate the history and traditions of one of Australia's great infantry battalions. 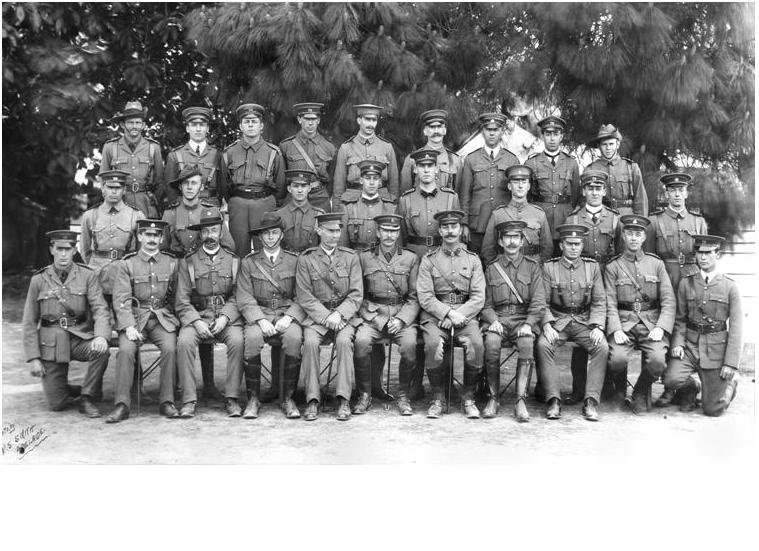 The 10th Battalion AIF Association wound up in 2016 after nearly 100 years of faithful work in support of the returned soldiers of the 10th and 2nd/10th Battalions and the 50th Battalion AIF. (C) "Pro Patria" by Steve Larkins, Bob Kearney and the 10th Battalion AIF Association. The Turks mounted a huge counter attack on the 19th May which was aimed at dislodging the ANZACS and driving them back into the sea. Coincidentally Simpson of Donkey fame was killed elsewhere on the 19th. I had the counter attack and the aftermath described to me by a Turkish guide, Mr Kenan Celic, at Gallipoli in 1988. He said that when Bean returned after the war they were looking to the east from the ANZAC positions and saw what was thought to be a chalk cutting in one of the ravines. Closer inspection revealed it to be the bleached bones of hundreds of Turks whose bodies were taken there after the battle. There is a memorial nearby to one of the Turkish commanders (one of the Division Commanders) involved in that counter attack. They put great pressure across the ANZAC line through Courtney’s, Quinns and Steele’s Posts etc. They took a fearful hammering though and did not mount another major attack for some time. The Tenth Battalion was in the front line when the Turkish attack broke over their position. An AWM photo is posted of graves of Tenth Battalion men most of whom were killed in the attack on the 19th. 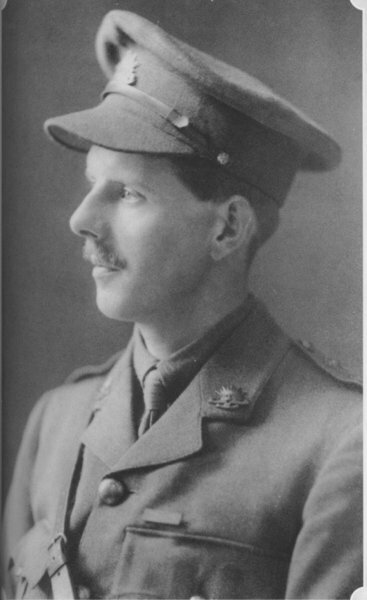 CO of the 10th Battalion, LtCol Stanley Price Weir wrote in a letter dated 20th May about a ‘dreadful battle yesterday”. “At half past three the Turks came over in hordes”. “Then they rushed to within twenty or thirty yards of our position, but our lads mowed them down like grass”. “Our lads were cool as if they were shooting ducks but the game on this occasion were the Turks, and they were giants too, make excellent targets”. “One poor chap died on his knees not thirty yards from our trenches and is still there in the same position. Captain Nott could not believe it possible until he went up there this morning and saw for himself”. The photograph of a section of the 1 Section men from the Scout Company is now well known. Their fate typifies that of many among those who landed on the first day. Only 25% or so were to survive the war. And so it was some six months after leaving Australia, the 10th Battalion Scouts came ashore in the pre-dawn light at Gallipoli. Their brief was simple - "go like hell for the Third Ridge". And go they did. Many were killed or wounded. Arthur Blackburn and colleague Phil Robin are credited by C.E.W. Bean with having reached the furthest inland of any Australian soldiers, before being forced back by Turkish reinforcements. See the 10th Battalion narrative. Of the nine men in the photograph, four were killed at Gallipoli in the first few days, including Phil Robin, a champion footballer with the Norwood Football Club. Wilfred Jose was to die on the Western Front and the remainder were all wounded or stricken with illness at some point. One of the survivors, Eric Meldrum, took his own life in 1922. Robin’s story was particularly tragic because his wife, whom he had wed in Cairo after she had travelled from Australia, died along with their baby in childbirth in London later that year.